Once upon a time, there was a boy named Bobby who was afraid of being happy. “If I get too happy, I’ll smile all the time and my cheeks will get tired!” he explained. “You’re stupid,” said his sister, Mary, who was afraid of having too much money. “If I get too much money, I’ll have to decide where to spend it, and that will stress me out,” she explained. “That’s the dumbest thing I’ve ever heard,” replied her best friend Tracy, who was afraid of loving too much. “If I love too much, I’ll get my heart broken and people will take advantage of me and I’ll have to do whatever anyone needs from me and I’ll be miserable,” she explained. Now admit it – you agree with Tracy, don’t you? Loving too much is dangerous, isn’t it? It’s vulnerable and painful. It’s hard work. Love will make you stressed out, overwhelmed, and depressed, right? Now THAT is the stupidest thing I’ve ever heard. I’m not saying I haven’t been stupid myself. I admit that I’ve believed such things before, and not too long ago. But I can admit I was a fool, and still am. I was wrong, but am working to get it right. Can you admit the same and change your thoughts and ways for the better? One day I looked around and noticed how loving we aren’t. I’m not saying we’re mean and hateful, spiteful and cruel, selfish and oblivious to others’ needs (though sometimes that’s certainly true), I only mean to point out that we only use probably about 5% of our heart’s capacity to love. Love is a natural state for us humans. How many times have you watched a youtube video about people rescuing a cat from a tree or bear cubs from a dumpster, or the runner who stops to help her fallen & bruised opponent over the finish line, or something else that restored your faith in humanity – but why did you need your faith restored in the first place? Because your faith had been tried. Because there’s not yet enough love flowing continuously around us. When was the last time you felt such overwhelming love that it filled you with peace and joy and security and healed all your old fears and wounds? When was the last time you loved so completely that it came pouring from your eyes in liquid light that healed everyone brave enough to hold your gaze? That’s what love does. That’s what we’re all capable of being and feeling and doing. Why, then, after all these thousands of years, why haven’t we figured out how to teach love? 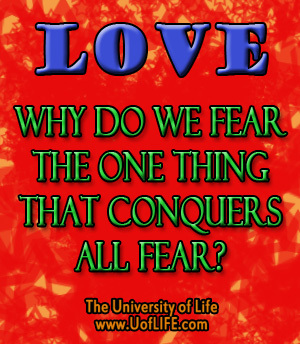 Why do we continue to misunderstand and even fear the one thing that conquers all fear? Why don’t we find hundreds of people who have mastered love so thoroughly that the rest of us can learn it by simply being around them? That’s what I’m going to attempt – to clarify love and debunk common myths one at a time. I’m an idealist and I’m determined and I believe it can be done. I believe it’s easier than you think. When I first put my mind to working out how to teach love, I was surprised by how many answers immediately showed up. I’m excited about many of the simple insights that makes me believe that love is more attainable than we believed. Today I’ll begin by debunking this myth: LOVE IS DANGEROUS. Well, okay, actually, it’s true. Love IS dangerous! If you open your heart, it can get stepped on. If you trust, you can be betrayed. If you give, you might get taken advantage of. But ya know what’s even more dangerous? Water. It can drown you. It sweeps away anything not anchored in the ocean. Worst of all, it holds millions of carnivorous sharks with razor-sharp teeth. Get the point? Water is good. Remember how refreshing it feels to dive into a calm ocean or body surf its waves that carry you to the beach? Remember the way a cool, clear glass quenches your thirst on a hot summer day? Remember how you’ll die if you go a few days without it? Love is like water. It feels GOOD! Like nothing else. It’s refreshing, healthy, and if you go too long without it, part of you will begin to die. As various country songs point out, it’s not love that hurts you – it’s the lack thereof. It’s selfishness, pride, and fear that tears your vulnerable heart in two. Love would have altered such things and eased the blow of any disappointments that may have come to you. If you REALLY knew how to love, you would rise above these setbacks and injuries more easily. You would stand tall and know your value and the fact that someone withdrew their love from you would not break the bank. If you REALLY knew how to love, you would be surrounded in such an active matrix of love flowing between your friends and neighbors and even strangers, that when one heart string broke, a dozen more would instantly catch your fall. If you REALLY knew how to love, you would be willing to suffer and you would realize that suffering isn’t so bad after all. Also, your suffering would be shared, the load distributed, and it would not weigh so heavily on your shoulders. Yes, love is good. You definitely need more of it. Not just more love coming your way, but spreading forth from your heart in all directions. There are several more reasons to fear love which I’ll address later. There are more myths to debunk and lessons to teach that will automatically make love come more naturally to us. Like that it’s easier to love everyone than just one person, which makes that a great place to start. Like that measuring love in simple ways encourages it to grow. Like why love doesn’t turn you into a doormat, or that the worst pain of heartbreak comes from closing your heart. If you’re eager to hear more, if these articles are hitting the spot, please say so by leaving a comment below or at Facebook.com/UofLIFE. I plan to share the dozens of ideas on the subject I’ve come up with so far, but hearing from you is the only way I know they’re working which will keep this project at the top of my tall list of plans and schemes to change the world. Thanks!